I am raving about Lemon Kiss because I am truly happy with their dresses. Usually, I would post about my Ukay Ukay OOTD but today my princess is taking the limelight. Mamanee: Hi miss, what's the largest size in this section? 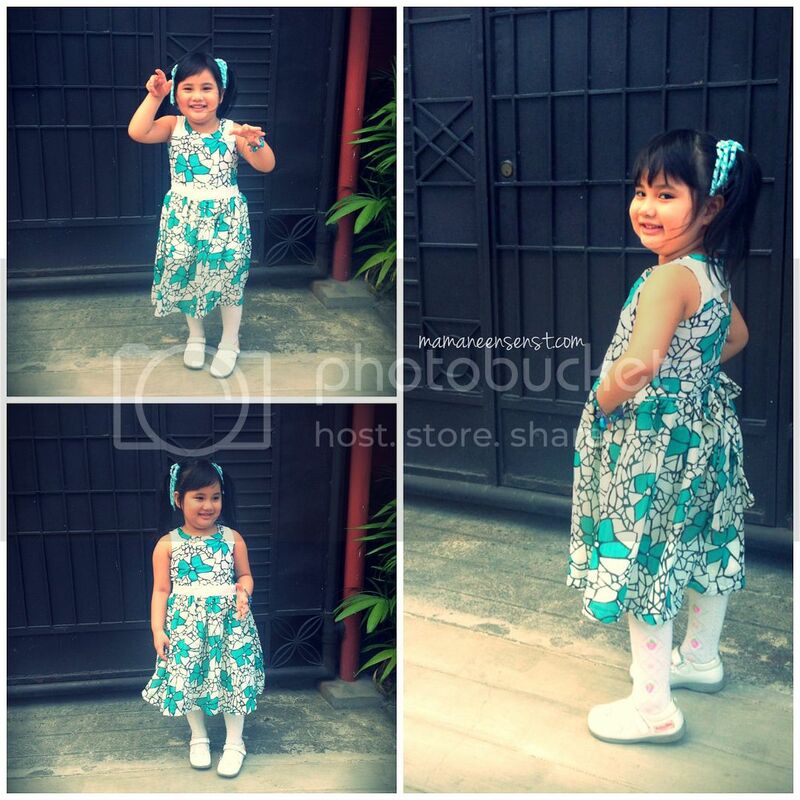 Pretty sales clerk: For 4 years old mam. Para kanino po? Mamanee: Para sa kanya oh (me pointing to McKenzie). Pretty Sales Clerk: Ay mam, sa children's deparrtment na po cya. Mamanee: Aray ko naman, eh 4 pa lang cya (me laughing at the same time). Crap, I just realized that we have graduated now to Children's Wear. 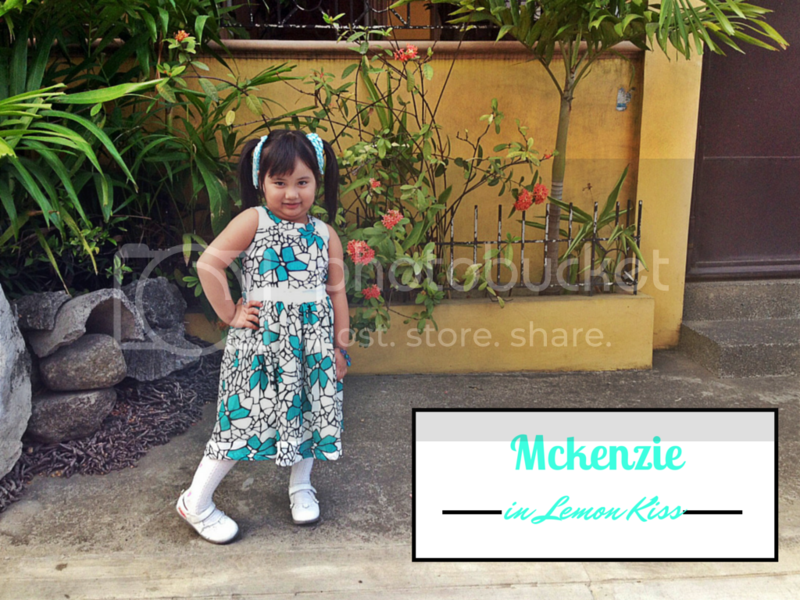 I have had slight difficulty when finding a great fit for McKenzie and then I came across Lemon Kiss, with all their pretty colors and frilly dresses. I loved their style because they were created for little girls. I am not ready to put McKenzie in little grown-up clothes just yet and I want her to enjoy being a little girl for as long as time permits. With a heavy heart I grab a size 8, don't get me wrong, not because it's a big size but because I realize she is growing up too fast! Next thing I'll know, she would have a boy-friend - waaah. Back to the dress, the pretty little number is made of soft material and I loved the accent at the back. I think she also loved the fullness of the skirt. She was comfortable and the dress fit perfectly. What's more is the length was long enough to cover her when sitting but also short enough for her to walk and run freely. Definitely, something to wear to church, a birthday party or even her first day of school (which is very soon). I would recommend their play wear and dresses to all mommies with princesses. Check their Facebook Page for availability and stores that they serve at https://www.facebook.com/lemonkissclothing. I love how she looks so proud and happy with her dress. I can't wait till my baby girl is already big enough to enjoy dressing up. Oh wait, I take that back, I don't want her to grow up too fast, haha. You have a cute kid :-).. the dress fits her well. I love buying Lemon Kiss for my dear niece too. Sometimes it's quite difficult to get a size esp. when a child is a bit on the healthy side. But kids really grow up so fast in this day and age. True enough mommy Vance! Yes, the healthy side is my struggle too with my princess hehe. Would recommend Lemon Kiss to my sister too. :) Thanks for this tip. Not only does she look good in Lemon Kiss, but the really seems to be having a blast modeling this dress. Lovely daughter! Ang bilis naman, mommy, boyfriend agad agad! heehee. Your daughter is such a sweetheart, at mana sayo sa modeling! Love the dress on your daughter! She seems to love it, too! What a nice dress on a very adorable girl! :) Don't grow up too fast! Big girl na! No wonder you were led to the children's section. But that is a pretty dress! Adorable! and so game to pose! Your little princess is so cute! I love the color of the dress you chose for her. Nice dress. :) Oo nga ang bilis nila lumaki. Nakakaloka! Pretty girl and pretty dress! I miss dressing up my daughter. She's a teener now and they're pretty touchy when it comes to their clothes.